Joan’s diaries end before anyone in the public knew about Bletchley Park in England. There M16 code breakers attempted — and succeeded — in figuring out German code and winning the war. Well, that’s one way of interpreting history. Certainly no one can deny the importance of this work. 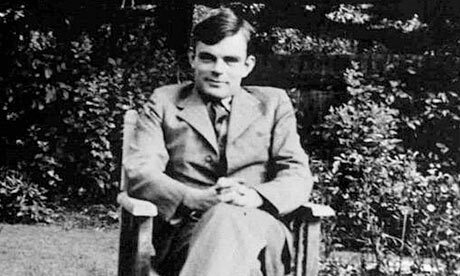 Alan Turing. Read more about him in this article from The Guardian. 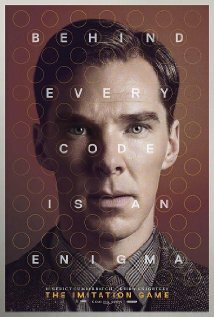 A recent Hollywood movie focuses on Alan Turing, brilliant mathematician. His story is also controversial for his being prosecuted for homosexuality after the war in 1952 (he was pardoned in 2013). Tragically, two years later in 1954, he committed suicide. Here’s the trailer for the film that examines Turing’s life. During the war, his work was key for England’s ability to resist the Nazi onslaught. 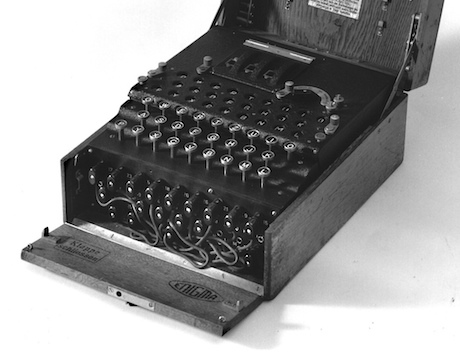 Cypher work during World War II. You can read this article in The New York Times and view its fascinating slide show with images of Turing’s desk and notes. 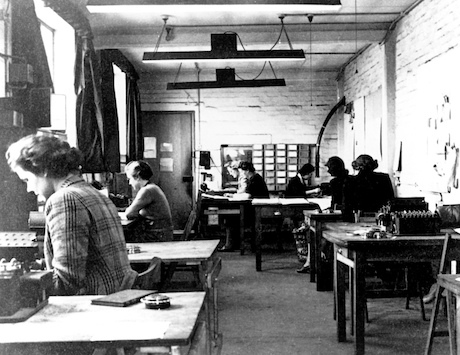 Follow the links on this page to read more about the secret history at Bletchley Park. But that was not the only secret work being done during WWII. My parents say that on their first date, they visited Jackson Park in Chicago and “played spies.” But I think Joan would be the first to admit that her spy work–if she had been a spy–would not have involved cypher work. Math was not her best friend. At age 14, Joan expresses antagonism towards math. A few days later, she continues her lament. I came home and said, “Don’t disturb me—I’m going to do Geometry,” and proceeded to read a Conan Doyle book—(not on Geometry). I guess I’ll do the Geometry tomorrow—maybe—I hope, I hope. Well, Geometry we have always with us. .
 Sir Arthur Conan Doyle wrote the Sherlock Holmes mysteries. 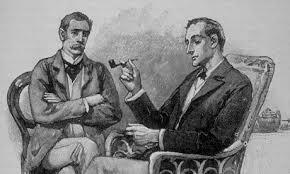 Doctor Watson and Sherlock Holmes. Benedict Cumberbatch, who plays Alan Turing in “The Imitation Game,” also plays Sherlock Holmes in the t.v. series. Sherlock. Geometry just won’t go away. We’re doing circle theorems in Geometry and Burton, who sits behind me, hums music from Wagner’s operas all through it—it’s very bad for my concentration which isn’t so strong naturally anyhow. Hello! To all awful things there must come an end—test week is over! Hooray! We had a Geometry test yesterday—et surprise (!) I got 94!—which is marvelous for me!!! Joan often uses Latin for simple words, such as “and” in this sentence. There was the handsomest boy(s) in my Latin class and most of the kids in Geometry are even dimmer than me—goody. Joan jokes about her math skills — or lack of them — but she’s clearly very bright. I’ve won the Scholarship for the University of Chicago Jr. College. Am I thrilled! Whoopee!!!!! University of Chicago Junior College, known as U-High, and today the University of Chicago Laboratory Schools. Today a girl, Shirley Schuerman, asked me to tutor her in Geometry! Whew! Was I surprised! However, she seemed serious and I like her so I said I would. She asked me if I’d start tonight at her house, adding that she had a nice brother (do I look like that kind of girl?). So I went over tonight and we did Geometry for 1½ hours. The brother was in some vague upper portion of the house writing a thesis for a Master’s degree—he’s already completed four yrs at Northwestern—whew! These sweet brothers. I feel awfully inferior. I didn’t see him but I saw his picture—he’s got grey eyes—!! But the main point is that someone asked me to tutor [her] in Geometry! Whoopee! Now called the University of Chicago Laboratory Schools. The next day, the news about her scholarship hits the school rumor mill. Of course it got around school that I had won it and everyone congratulated me and so forth. But they all seemed so awfully surprised—do I really seem that dumb? And my Geometry teacher, Mrs. Jarvis, heard about it and asked me about it in class. She seemed so dubious about it that I had to laugh. I’m afraid she hasn’t a very good impression of me for she went away shaking her head and saying, “I can’t understand it.” Evidently my Geometry record is not so hot. . . . Mrs. Hellman made me read my letter in class—I blushed so sweetly. . . .
Well, I’m slowly realizing that I’ve won the scholarship! Do I feel queer. All day people were making cracks. You see, I don’t look like the smart type, I’m afraid. Thankfully, the end of the year comes. When Mrs. Uhlir was bragging about me to the class, she looked at Lorraine who had been standing sorta in background and said, “What are you getting in Geometry?” Lorraine said she was promised an S. Then to me, “And you,” confidently. Oh did I feel terrible when I said G. Of course, I may get an E but G is a surer guess. Anyhow, Mrs. Uhlir looked quite shocked. And the class grinned its head off (query: does a class have a head?). The grades seem to have been E (excellent), G (good), and S (satisfactory). Hello, well, I should be speaking French to you after a week of that delightful language, but unfortunately (or fortunately) all we’re having is pronunciation. Lord help us all. It’s fun—though—I like all my classes—fairly well though I get rather bored in MVC although it’s an intermediate course. Phy Sci turns out to be rather unboring so far but I fear I am no genius in math. We have Dean Smith and he’s just swell, you know, but I just don’t know square root! Germans say Russia is conquered and they appear to be getting on to Moscow. Hitler told Germans on October 3, 1941, that the Russians were vitually defeated. Fortunately, the Germans were wrong.
. . . Just think, I’ll be 19 in a month, getting old, gramma! I got the highest mark in our last French test—94—but we have another tomorrow so woe be unto me—also highest in Poetry on Milton. I don’t like him—and Mr. Bond had me read my paper aloud. I was quite embarrassed. . . . Passed Math in Phy Sci too—with the lowest C. Was quite happy! Whee! . . . We’re on astronomy now. . . . So, Joan was not a math whiz like Alan Turing. But she was an astute and subtle writer. For which we are all grateful!